Sport's power to bridge divides was once again on show at opening ceremony of the 2018 Winter Olympics. The opening ceremony for the 2018 Winter Olympics in Pyeongchang was a spectacular start to the Games. Like other Olympic opening ceremonies, it had colour, energy and movement, and had millions across the world glued to their TV screens. But the Pyeongchang Winter Olympics has an additional element that makes it particularly special. In keeping with the theme of the opening ceremony – peace – teams from host country South Korea marched into the stadium together with teams from neighbouring North Korea. Given that the two nations have technically been at war for decades (with just a ceasefire in place), and that recent verbal exchanges between the US – South Korea’s close ally – and North Korea have reached a new level of antagonistic intensity, with some commentators suggesting an ugly conflict was imminent, the announcement that the teams were going to enter the stadium together was greeted with surprise and joy across the world. Is there any mechanism other than sport that can be used to bring people together despite their apparently intractable differences? Sport can be very powerful. At the Winter Olympics, there is an opportunity for nations to put aside their differences and concentrate on friendly competition. We have a chance to recognize that we are all human beings, that we all belong to one big family and that we can participate in sport and simply enjoy ourselves. Sport is the bringer of peace. No one is suggesting that sport can change everything. It would be naive to believe that, where there is war, sport arrives and suddenly there is peace, love and mutual understanding! To create change, many different components must be aligned, including governments, politicians, media and industry. But sport can play a crucial role in helping create that alignment. 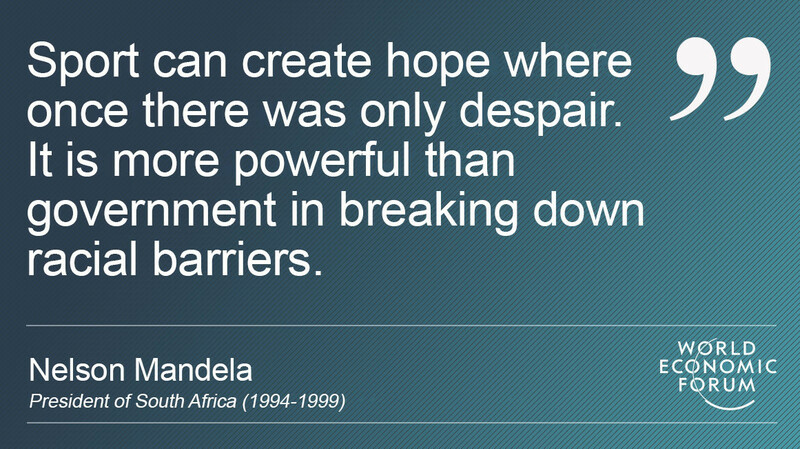 The most famous example comes from South Africa after the fall of the apartheid regime, Nelson Mandela’s release from prison and his installation as president. At the 1995 Rugby World Cup, Mandela used sport as a vehicle to demonstrate how people from opposite ends of the political spectrum – many of whom had believed that violence was the only solution – could come together to support one national team, no matter the colour of their skin. It was a monumental success, demonstrating what was possible using sport. 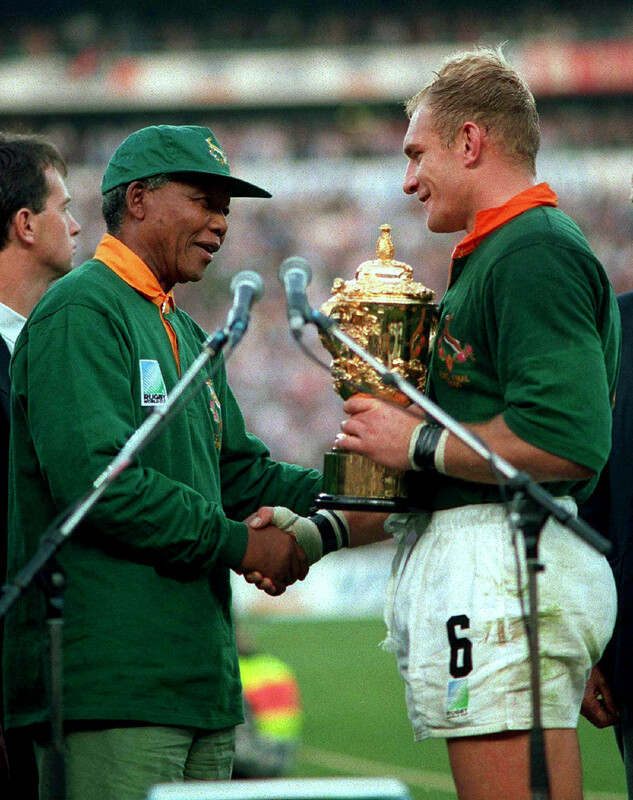 Nelson Mandela congratulates captain Francois Pienaar at the 1995 Rugby World Cup. We all love our nations winning cups and medals at global sporting events like the Winter Olympics, but that is only one element of the sporting landscape. Sport also has real power at grassroots level. There are thousands of examples around the world where sporting initiatives have created real and lasting change. For example, the Homeless World Cup, which uses football to target the poorest of the poor across the globe, has touched the lives of 1.2 million homeless people since it started in 2003. A huge percentage of those people find housing, obtain jobs, come off drugs, go to college and rejoin society. Without sport, this wouldn’t – couldn’t – happen. Of course, the Paralympics has transformed our understanding of disability and led to change in government policies in terms of inclusion, while the Special Olympics, founded in 1968 by Eunice Kennedy, changed society’s attitude towards people with intellectual difficulties. Both have used sport as a catalyst for profound change. The sports industry itself has tended to ignore the powerful change it can drive, preferring to highlight the medallists and the cup winners. However, it is increasingly talking about the power it holds to have a real postitive impact on local communities and on society as a whole. Connected with this is the emergence of new data and research that shows the immense social capital value of investment into sporting initiatives. Tiny investment results in social capital outcomes of tens of millions – which has to be very good news. Back in Pyeongchang, as the music plays and the teams enter the arena, a new sense of optimism and hope will emerge. People want peace, and the International Olympic Committee should be praised for being an organization that puts peace at its heart. Here’s to a successful and enjoyable Games with an impact that reverberates beyond Pyeongchang and into the future.